Four Comics I Want for NCBD: 2016/05/25 – WORST. COMIC. PODCAST. EVER! We are now on the back side of Planet Comicon so you might imagine that they guys wouldn’t want to read comics for awhile. Ha, ha, ha. Clearly you don’t know us very well. Normally this would be Hillary’s week to give us her picks but she is still trying to get out of cosplay character and neither princesses nor ninjas write comic reviews. So John and Jerry have stepped in to give you two picks each for Four Comics I Want for New Comic Book Day on May 25. DC Universe Rebirth #1 ($2.99, DC Comics): We’ve all been waiting for it. Or fearing it. Or something. Still with 80 pages at a price of $2.99 and names like Geoff Johns, Phil Jimenez, Ethan Van Scriver, Ivan Reis, Gary Frank and others, the price is right to get the first taste of what DC has planned for Rebirth. While DC says it isn’t a reboot, it certainly seems like this is at least a semi-boot. Lots of changes of lots of the same so I’m not sure what to expect, but when Johns does events they tend to be huge so I’m in to find out what is next. Divinity II #2 (of 4) ($3.99, Valiant Entertainment): In the pages of Divinity, Matt Kindt created a new and nearly all-powerful Russian cosmonaut that returned from the edge of the universe. The man/god was interested in making the world a better place but the world wasn’t ready for his kind of help. In Divinity II, a second cosmonaut returns and she is interested in returning Russia to its place as a world power … as THE world power. With her reality altering powers and intense determination, it will require everyone to stop her. If they can. Check out this incredible mini-series with mind blowing art from Trevor Hairsine and stunning colors by David Baron. I just read a preview copy of issue 2 and it was fantastic! Star Wars #19 ($3.99, Marvel Comics): This title has been such a solid read since issue #1, and it could easily be on our list every time it comes out. I picked it this week for two reasons. First, this concludes the “Rebel Jail” storyline from Jason Aaron and Leinil Francis Yu, and may give us some closure to the Doctor Aphra story arc that first started in the pages of Darth Vader. But the main reason for this pick is that it gets us one issue closer to the start of the next story arc, which Jason Aaron teased at the Marvel: Your Universe panel I hosted at Planet Comicon. Beginning with Star Wars #21, the rebels encounter an elite Stormtrooper squadron. So elite that these troopers don’t miss their targets. I so want to read this next story, so let’s get this one done! Hero Comics trade paperback ($19.99, IDW Publishing): For the last several years, IDW has graciously helped put together an annual anthology comic as a fundraiser for the Hero Initiative. 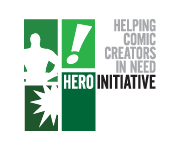 The comic is filled with short stories and autobiographical pieces which emphasize the importance of the Hero Initiative. Now, IDW is collecting multiple issues into one trade paperback, for the low price of $19.99. Before you roll your eyes at the price (remember, Hero benefits on the sale of this book), take a look at the creator list with this book. Writers include Kurt Busiek, Howard Chaykin, Neil Gaiman, John Layman, Dave Sim, Bill Willingham, and more! That is an incredible list right there, but I am not done. The artists in this book include Kaare Andrews, Kevin Eastman, Rob Guillory, Gene Ha, Sam Kieth, Ashley Wood, and more! Have I sold you this book yet? Maybe this will help…. the Gallery section showcases the work of J. Scott Campbell, Arthur Adams, Mark Schultz, Matt Wagner, Adam Hughes, Darwyn Cooke, and more! Seriously, you will never find this much talent in a single book anywhere else. Buy two copies of the book this week, one for yourself and one for you to give away to a friend.